Probably by now you have heard that there is a new iPhone phone. Yesterday, Apple announced their 2 new phones called iPhone 5C and iPhone 5S. Nothing has change in their physical outlook but according to apple they have offered a mid range price phone which is 5C. iPhone introduces iPhone 5C with colored polycarbonate body. Many says that Apple is now loosing from their competitors such as Samsung which lately introduces the Samsung Galaxy Note 3. 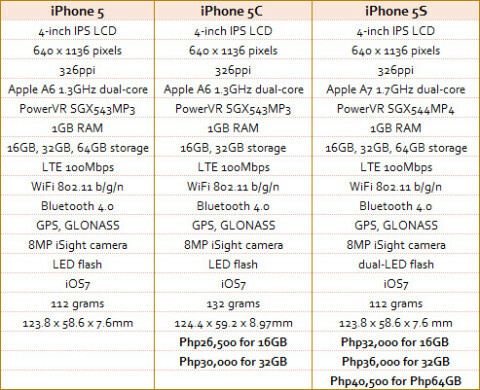 Basically iPhone 5C is almost the same as iPhone 5 but heavier and with a (plastic) polycarbonate body. We need to know the difference of A6 and A7 chipset in order to know the difference in performance. I think Lenovo K900 is a good match for iPhone 5S. So would you think that this new Phones will lift Apples price in the US Stock Market? Will it compete with the increasing sales of Android phones?